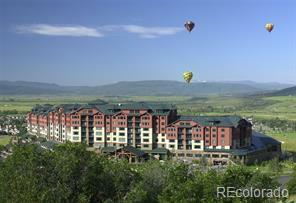 3rd floor corner unit with exceptional views of Buffalo Pass, downtown and Emerald Mountain from the condo. Sit on your balcony and enjoy sunsets and the changing seasons on Mt Werner and the Yampa Valley, and the occasional fireworks display on Howelsen Hill! 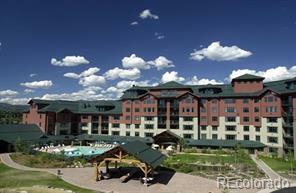 Very versatile 2 bedroom / 3 bathroom Alpenglow unit. Jacuzzi tub in master and 2 fireplaces. Second bedroom has two queen beds plus a queen sofa sleeper and is OVERSIZED. Condo can sleep up to 12 people! 6-7 weeks of ownership each year. Great rental potential. 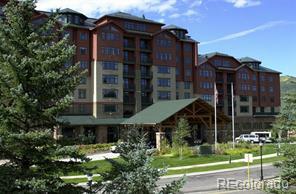 Wonderful year round amenities including pool, hot tub, fitness facility, parking, restaurants, owner's ski storage and lounge in gondola square. Mountain views. RCI exchange program.